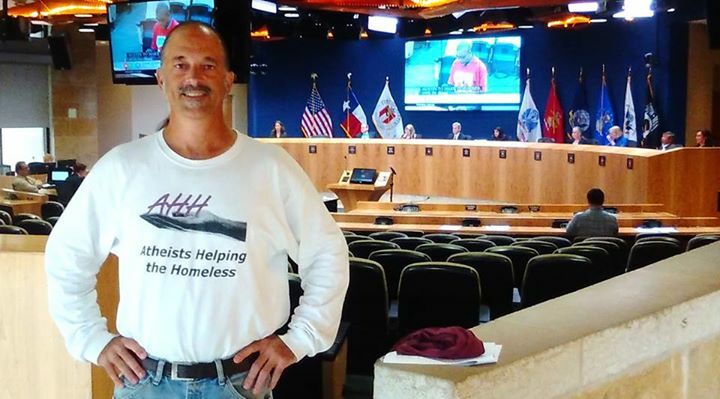 Atheists Helping the Homeless was started in 2009 with Austin as its very first chapter! 1. To help some folks in need. 2. To show by example that Atheists do care and do help. Atheists Helping the Homeless is a group of Atheists and other Freethinkers who help the homeless by doing monthly giveaways of free items to homeless people and other people in need. We give out toiletries, food, clothing, reading material and other items that folks need. We've done a lot over the years, so we'd like to share this best, most comprehensive history of AHH. If you can think of something that's missing from this, please let us know. Thanks! In September of 2009, Joe Zamecki investigated the situation with help groups and homeless folks gathering under I-35 at 7th Street in Austin, Texas each weekend. It's a weekend long festival of giving, so to speak, and most of the help groups that go there are church groups. Some of those groups also hold church services at the same time, even featuring live bands, lots of religious singing, and big group prayer circles. He interviewed several homeless people at that location and elsewhere in downtown Austin, and found that there was a niche to fill: Toiletries. Some of the help groups and shelters in Austin gave out toiletries, but he found that there wasn't enough of that being given out. He also found that many homeless people were tired of all the religion in their faces when they were getting help. He decided that it was time; time to finally create that help group that so many Freethinkers had dreamed about. It's been a topic of discussion at lots of Atheist group meetings all over the world, but in Austin, there was a beautiful location and situation, ready to go. He got with Chuck Clark and Mark "TXatheist" "Johnson" Simmons, making a trio of founders, all proud Atheists. They founded "Atheists Helping the Homeless," and began to do monthly giveaways, there under the bridge. Soon, other volunteers joined on, and we went from doing tiny giveaways using our vehicles as tables, to large giveaways using a folding table, to larger, using several tables. The group grew in every way possible. More volunteers helped out, more donors sent money and items to give out, and more folks in need came to our tables. As we brought more items, we were able to help more people. The Foundation Beyond Belief gave their first group grant to AHH. It was for $1,500. We wanted AHH to be a simple group without any hierarchy structure and without meetings other than the giveaways. The simplicity has kept AHH attractive to volunteers who don't want a lot of hassle involved with their volunteer efforts. Since that first giveaway much has changed. After seeing the work done in Austin, others began to take an interest in beginning chapter in their own cities. From San Antonio to Orlando, from DFW to India, people began holding giveaways of their own.